Looking to reach their full physical potential. 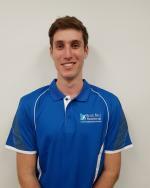 Sam is passionate about working with you to eliminate pain and in particular providing Sports, Orthopaedic and Neurological Rehabilitation. On top of all this Sam is a genuine, caring and compassionate Physiotherapist who will listen to your concerns and work together with you on a holistic solution that fits your lifestyle. Outside of work you will find Sam playing Volleyball, Surfing & Snowboarding (when he can). Sam also runs Pilates on Mon 6pm, Tues 7am and Weds 6pm. Bookings essential.